5 minutes to---wangfujing street. Beijing xiaoyuan hotel (Courtyard Inn)is located in the heart of Beijing. 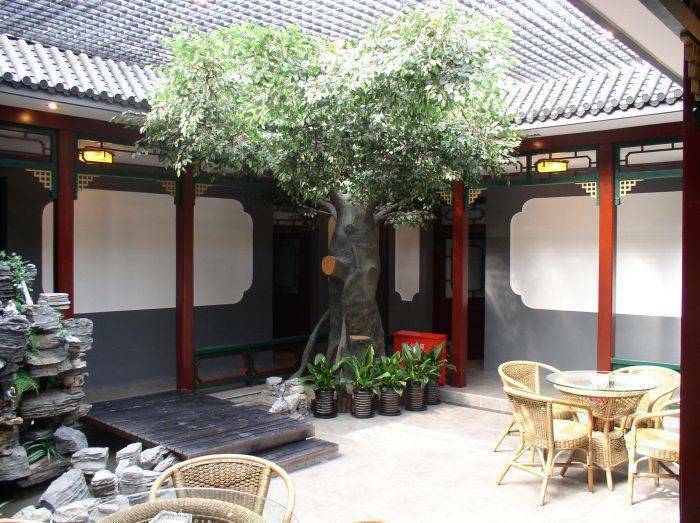 Traditional Chinese courtyard style and the view of historical Beijing Hutong are both the attractive feature of the hotel. The hotel is adjacent to Forbidden City, the spectacular Tiananmen Square, Dongsi Street, Wangfujing and other historical Beijing commercial streets. The great accommodation location provides guests with easy access to a number of Beijings tourist attractions and business premises either by public transport or taxi. Traditional Chinese room style, courtyard waterfall, ponds and delicate corridors and bridges bring guests the unique comfort and relaxation. Together with traditional Chinese food and drink, our guests will be able to have an outstanding accommodation experience. Beijing Courtyard Inn can be your warm home in the centre of Beijing, no mater if you are on business trip or making holidays. Staying with us is a good start for exploring this ancient city. No matter your heart is with the old imperial court or ordinary people living in the ally ways, you will find your own experience from all walks of life in this fascinating city during your stay. You are assured to have a good time with us! 2 Free daily bicycle rent service and shuttle service to Main Street . 3 Free computer. mobilephone. kitchen. Internet. Here will be your second room in china. You can book beijing dailytour to the great wall and ming tombs in the hotel. From airport: Take airport shuttle bus to Dong zhi men, then take a cab (RMB 13) to hostel or take a airport express train (RMB 25)get off at Dong Zhi Men subway station and then take a cab to our hostel. Also we have airport pick up service, if you want reserve, please send E-mail for us, told us your flight information. Beijing Rail Station: Take bus No. 24 to Yan yue hutong, or take a cab (RMB 10). Beijing West Rail Station: Take a cab (RMB25) or bus 109, get off at the chao yang men nei. Welcome to Beijing and xiaoyuan hotel. Welcome to Beijing and courtyard inn. With stylish Chinese decoration and convenient facilities, our Luxury Standard Room offers you TV, International Telephone, Internet Access, in order to ensure our guests enjoying the outstanding entertainment and communication facilities. Moreover, Luxury Standard Room provides our guests with decent living room items. Combined with the strong Chinese culture elements, Beijing Courtyard Inn will surely be your ideal accommodation for your business or tourist trips.